15 BJP MPs of Madhya Pradesh ‘failed’ in the RSS survey! The performance of BJP MPs proved ‘disappointed’; the BJP hoping for the support of only Prime Minister Narendra Modi's name and work in the Lok Sabha elections! FEB 14 (WTN) - As you know, only a short time is left for the Lok Sabha elections, in which all political parties are engaged in making their 'strategies' for the elections. If we talk about the ruling party BJP for the 2019 Lok Sabha elections, then the BJP has been 'worried' and 'tensed' after the defeat in the three states’ assembly elections. On the other hand, if we talk about the Madhya Pradesh; then it is said that BJP had distributed tickets while ignoring the RSS ‘survey' and 'advice' in the assembly elections, which led to the defeat of the BJP. But now the BJP is not looking in the mood to 'ignore' the RSS 'advice' in any way in the Lok Sabha elections. As you know, where the entire opposition is going to united to defeat the BJP, in such a situation, the BJP knows that they will have to face the opposition in its Lok Sabha elections on its own 'spiritedness’ and the BJP can do this only when the party has 'strong candidates’ in the Lok Sabha elections. If Delhi is to be ruled, then the 29 seats of the Madhya Pradesh have a lot of 'importance'. For your information, let you know that in the last Lok Sabha elections, the BJP had won 27 out of the 29 seats in the state. But if the survey of the RSS is to be believed; this time for the BJP, the difficulties’ may arise in the Madhya Pradesh because the image of BJP MPs on the 15 seats is not good. According to the information, the situation of the BJP in the 15 constituencies of the state has become 'worrisome' due to lack of development work in parliamentary constituencies, distance between the MP and the general public. 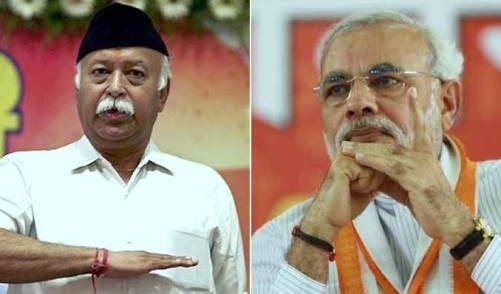 It may be said that the BJP, who faces defeat after ‘ignoring’ the RSS 'advice' in the assembly elections, will not want to take any risk of 'ignoring' the advice of the RSS in the Lok Sabha elections. According to the RSS survey, these are the names of MPs who have been proved ‘weak’ in their parliamentary constituency; Morena MP Anup Mishra, Tikamgarh MP Virendra Khatik, Mandsaur MP Sudhir Gupta, Dhar MP Savitri Thakur, Bhopal MP Alok Sanjar, Vidisha MP Sushma Swaraj, Shahdol MP Gyan Singh, Ujjain MP Chintamani Malviya, Sagar MP Laxminarayan Yadav, Bhinda MP Bhagirath Prasad, Khajuraho MP Nagendra Singh, Balaghat MP Bodh Singh Bhagat, Khandwa MP Nandkumar Singh Chauhan, Damoh MP Prahlad Patel and Dewas MP Manohar Utalwal. Now it is necessary to observe how much the BJP gives priority to the RSS ‘advice’ during the ticket distribution in the Lok Sabha elections. It is true that the BJP will contest in the Lok Sabha elections on the 'name' and 'work' of Prime Minister Narendra Modi, and the party is hoped that the voters will vote after watching these two things. But the BJP should not forget that the ‘weak’ candidate in any constituency can demolish the BJP’s dream of winning second time in the Lok Sabha election. While the entire opposition is being 'united' against the BJP together; in such a situation, the BJP should not 'ignore' the advice of the RSS and at the time of ticket distribution, the RSS survey must be fully examined.